If you’re up to date on some of the more prominent names in the specialty tea industry, then Roy Fong might ring a bell. While most people who know the name may know of him as Roy Fong the tea merchant, there are also those who may know him as Roy Fong the author and even Roy Fong the aspiring tea farmer. The latter of which is a distinction that’s not been bestowed on many people here in these United States. As the story goes, Fong got his introduction to tea at the ripe old age of six when, as one version of his bio puts it, “he would interrupt his walk to school to watch Hong Kong day laborers’ impromptu gong fu brewing sessions.” Quite a few years later this interest in tea blossomed into a business venture when he began importing Chinese tea into the United States. 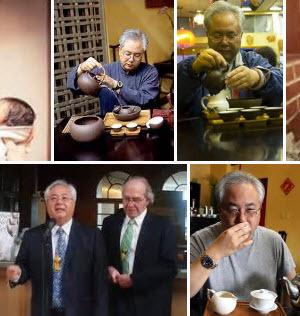 In 1993, he took his next step in the tea business, opening Imperial Tea Court, a tea shop in San Francisco which is said to be the first traditional Chinese teahouse in America. Which has survived and thrived to this day and even added a second location. Fong the tea farmer embarked on this particular venture a few years ago when he purchased a plot of land in the Bay Area. When I wrote about the project in the summer of 2013 the land was still being brought into shape in order to turn it into a proper tea farm but no tea plants had been put in the ground yet. Which means we won’t be drinking any tea from there for at least a few more years. But that will be something to look forward to, for sure. Look here for the latest update on the farm’s progress.